Observation + preparation = Aspertools - Rachel Bédard, Ph.D. Always on a quest for new books to help me understand my clients, I recently went hunting for new resources. Sometimes “new” is a few years old, but “new to me” counts! 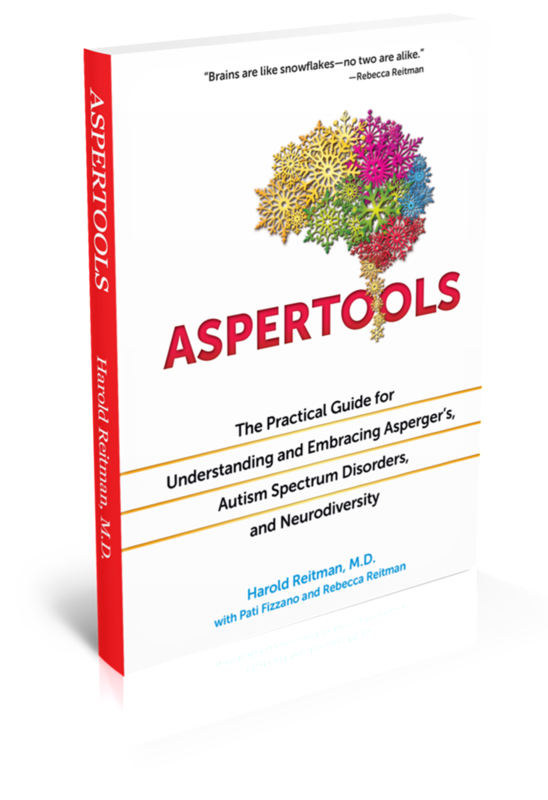 In this case, I discovered the 2014 book Apertools: The Practical Guide for understanding and Embracing Asperger’s, Autism Spectrum Disorders, and Neurodiversity by Dr. Harold Reitman. This short book is an easy read that tries to accomplish two things simultaneously: recognize that no two brains are wired alike, and offer practical tools for common concerns for folks on the spectrum (yes, those goals may seem to be in opposition, but it works!). The book has a clear structure, which makes it easy to read. There is a clear pattern of identifying the problem, providing clear examples, providing clear solutions, and gleaning advice from two professionals. If the book could be distilled down to an equation, I suspect it would look like observation + preparation = aspertool. As an example, in the chapter about anxiety, the reader is advised to be alert to subtle cues about anxiety, and take care of the subtle symptoms before they can become more obvious. Similarly, the reader is advised to prepare the person on the spectrum for what might come (family event: think about who will be at the event, what types of experiences you had with that person previously, what types of activities might be included, how to get a break, etc.). If you like this type of problem-solution approach and clear writing, you might also check out the author’s website, differentbrains.org. Dr. Reitman is committed to finding solutions and promoting a positive agenda in the world of neurodiversity. Grab your sense of observation, make some preparations, and enjoy those aspertools!